Supplementary material reads: "L. A. City Pool Aquettes perform for L. A. City Recreation & Park Dept. Dedication ceremonies of City Pools & all city water carnivals of which proceeds go to defraying expenses of the 'Learn to Swim Campaign' sponsored each year by L. A. 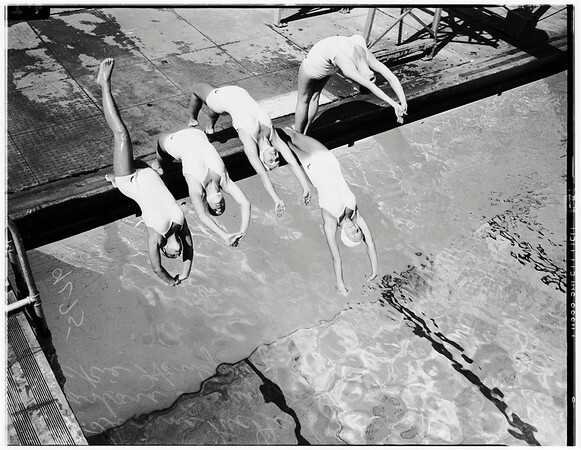 City Parks and Recreation coached by Ruth Nurmi, former Olympic diver & Mary Alice Shaw -- UCLA Aquatic Coac, aqua Galla of 1948. Aug. 26-27-28-29 L. A. Swim Stadium".